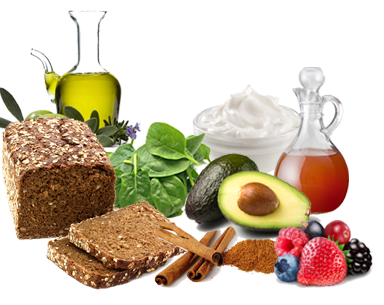 We have selected our favourite top 8 foods to turbo charge your health. These antioxidant-dense oils help you absorb fat-soluble vitamins (A, D, E & K), get glowing skin, avoid blood sugar fluctuations, and raise healthy HDL cholesterol levels. *Olive oil and flaxseed oil lose their healthful properties when heated. Not to be confused with processed foods with ‘wholegrain’ on the ingredients label, real whole grains (think rice, oats, rye, etc.) are unrefined, high in fibre and nutrient-dense. They help reduce your risk for obesity, diabetes, cardiovascular disease, heart attack and stroke. They’re loaded with vitamin E and carotenoids which help prevent eye disease. They’re also high in healthy monounsaturated fats, which help you absorb nutrients, feel fuller longer and lose belly fat. Cinnamon is chock-full of antioxidants and it reduces inflammation. It’s an excellent companion to carbs because it helps to prevent your blood sugar from rising too high after eating. They are vitamin, mineral, antioxidant and fibre powerhouses that promote weight loss, detoxify the body, boost immunity and preserve eye and bone health. They also lower your risk for cardiovascular disease, arthritis and diabetes. Not only does it reduce blood sugar, abdominal fat, inflammation and free radicals, it may also help lower your risk for heart disease, atherosclerosis, osteoporosis, cancer and diabetes. These high fibre, low sugar, antioxidant superstars lower inflammation, balance blood sugar, aid in weight loss and boost your immune system. Plus they keep your brain sharp and may reduce your risk for Alzheimer’s disease. The probiotics found in yogurt and kefir boost your immune system and because there is a gut-brain connection, they may even prevent depression and enhance your mood. They also help prevent and treat digestive disorders (IBS, Crohn’s etc. ), urinary tract infections and yeast infections.